Taste test: These are very strong ketchup chips, they taste like you've dipped your potato chip in a big vat of ketchup. 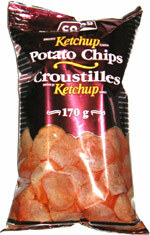 Not for the weak-willed ketchup chip taster, you really have to like your ketchup to try one of these chips. Also, the size of the chip impressed us, as there were not a lot of 'broken' chips. Powder distribution was inconsistent, some chips were practically red with powder, others were 'lightly' flavored. Probably one of the better ketchup chips I've had, the taste was pure ketchup (almost a spicy ketchup), not a ketchup and salt taste. Smell test: A very strong ketchup flavor wafts up from the bag.